The next step in a multi-million pound scheme to upgrade a key route linking the Midlands and South West has been announced by Highways England today. The improvement planned for the A417 near Gloucester will upgrade the last stretch of single carriageway of the road linking the M5 with the M4 - commonly known as the ‘Missing Link’ - to dual carriageway. It will bring more predictable journey times and improved safety for drivers, while communities will experience reduced air pollution from queuing traffic. “This scheme will bring a number of benefits to the area. “Besides making journey times more reliable, reducing rat-running through neighbouring communities, it will also improve the lives of people who live close to the route and make it easier for drivers, walkers and other local road users to get around. Following extensive investigation of possible route options, Highways England presented two possibilities to the public in 2018. Nearly 2,000 people took part in the consultation, with 800 individuals attending events. Around three quarters supported the option, which, with further refinement based on comments made, forms the basis of the route announced today which will create a new 3.4-mile dual carriageway section on the A417. The new dual carriageway will be complemented by an extra climbing lane at Crickley Hill for slow moving traffic. 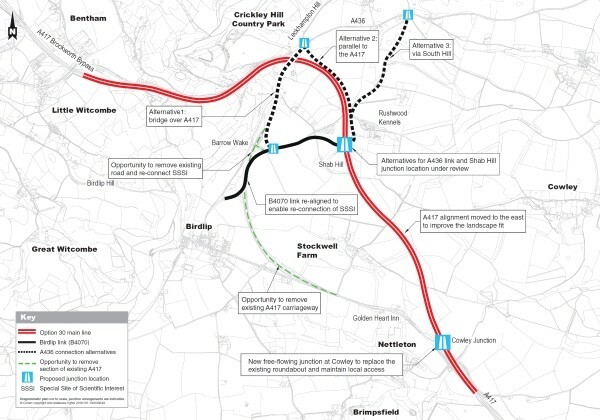 A new section of road built through Shab Hill to the east of the existing A417 will re-join the road near the current location of Cowley roundabout and a new junction will be created at Shab Hill with links to Birdlip and the A436. The Air Balloon Roundabout and Cowley Roundabout are to be removed as part of the scheme. Working in an Area of Outstanding Natural Beauty it has been important to work with key stakeholders and this option will see work to restore and improve the landscape and create improved connections including a green bridge. Walkers will also benefit as the proposal will improve access to public footpaths, including the Cotswold Way National Trail and the Gloucestershire Way, helping more people to enjoy the routes safely. Work now will focus on more detailed design, which Highways England will put to people for their input again later this year before submitting a planning application, known as a Development Consent Order. The work to investigate route options for the Missing Link was made possible by the Government’s £15 billion road investment programme. Delivery of the project will be subject to confirmation of funding within the second Road Investment Strategy, which will cover the period between 2020 and 2025.